One of the best year-round tips I can give you for keeping your weight in check holds its ground even more during the holidays. And that is, follow the 50/50 rule for vegetables and fruits. Remember, it’s a plant-based diet. That means you eat a whole lot ‘o plants. The 50/50 rule makes it all so easy. No need to count, weigh, measure, or otherwise addle your brain with making healthy, slimming meals. Once I got this – well, let’s just say it took an extra 1/2 inch off of everywhere and makes keeping weight in check running like well-fed clockwork. Imagine that at day’s end, you could pile all the food you ate during the day on a big platter. Plenty of dietary fiber which is key in satiety and keeping you naturally thin. Rarely do I get a complaint such as this. But there are some skinny grrls and guys – see Real Men Eat Plants – out there wanting to plant-strong their diet yet need or want to put the brakes on weight loss. In that case, you can change the 50/50 rule to the 1/3 – 2/3 rule. 1/3 of your platter by day’s end is piled with plants. Vegetables and fruits. Want to be notified right away when the next tip in the series is posted? You can, by subscribing to be sent Email Updates or RSS notifications. thanks Lani for once again cutting right to it and making it so simple. What a relief! That salad looks incredible. What kind of beans are in it? It helps to know about he 1/3 2/3 , too. My husband is one of those ‘skinny guys’ so I’m always looking for ways for him not to lose too much. Gail, thanks for your post. 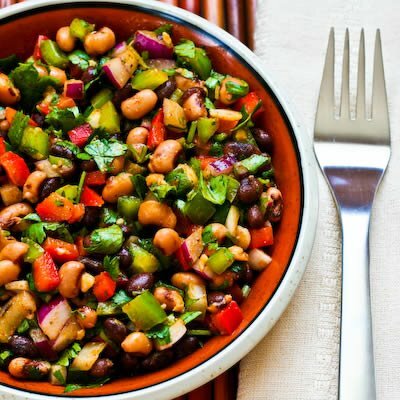 You could use any bean, but this one has black-eyed peas and black beans in it. Gotta love the color. Once again, you make something that ‘seems’ so complicated SO easy. This week I’ve been close to 75% animal fat/protein free and I’VE LOST 3.5 pounds!! OH!! I love my protein shakes made w/pea protein!! You’ve lost 3.5 lbs during the holiday season? Well, look at you! Congrats on that AND congrats on nudging out the animal fat and protein. Excellent and a big, fast way to improve your diet. Thanks for coming by to tell me and I’m glad you like the 50/50 post. I HiGHLY aspire to “making something that seems complicated SO easy” – music to my ears!